This location is known as Al-Maghtas. In Arabic it means "baptism" or immersion. This site is the traditional site of Jesus' baptism by John the Baptist, his cousin and forbearer. 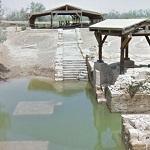 There is another site close by that claims to be the site of the baptism, however most Christians believe this to be the true site.